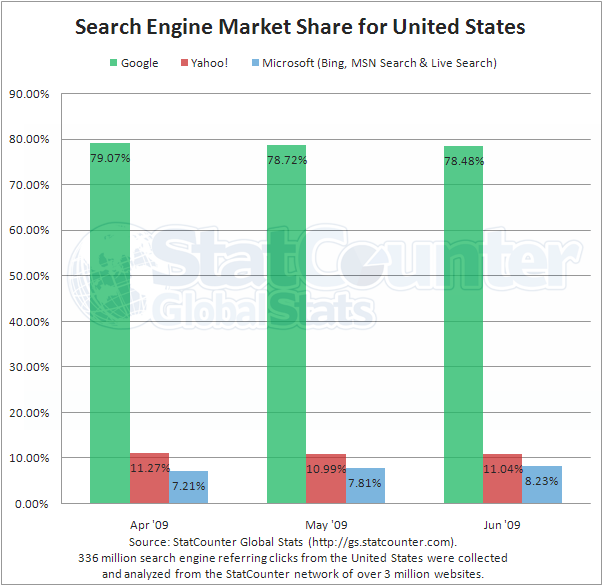 Boston (US); Dublin (Ireland): Wednesday, 1st July, 2009: Bing has increased Microsoft's share of the search market by 1% in the US according to analysis for June conducted by web analytics firm StatCounter. Microsoft had 8.23% market share in June, behind Yahoo! at 11.04% according to monthly analysis by StatCounter Global Stats. Google still dominates the US market but has fallen back slightly from 79.07% in April to 78.48% in June. Microsoft US market share has gone from 7.21% in April to 8.23% in June. "At first sight, a 1% increase in market share does not appear to be a huge return on the investment Microsoft has made in Bing but the underlying trend appears positive," commented Aodhan Cullen, CEO, StatCounter. "Steady if not spectacular might be the best way to describe performance to date." Looking at weekly trends for June, Aodhan Cullen said that Microsoft (Bing, Live Search and MSN Search in total) had peaked post launch at 9.21% in week 1st - 7th June. But after falling away in the following two weeks it had staged a comeback in the last week in June to 8.45%. Globally Microsoft appears to be making modest headway to date going from 3.08% in April to 3.30% in June. In the same period Yahoo! has fallen from 5.48% to 5.15% globally. While Google still dominates the global market with 89.80%.